As the vast majority of native American Indian history is based in oral tradition, which was only committed to writing many years later, the histories shown in the king list pages are, for the most part, incomplete. 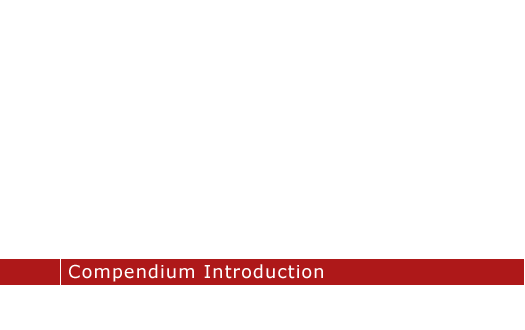 What follows there and in these compendium pages, whilst being a little more than merely 'selective', has yet to achieve 'exhaustive' status, still less 'definitive' - but it is heading in the right direction! A fairly exhaustive list of tribes, sub-tribes, and bands is or will be included, which will be supplemented with more details as this section evolves and improves. As our knowledge grows and we learn more, and additional information regarding tribal structures, lists of battles, and participating chiefs will be added. Some tribal groups such as the Apache, Iroquois, Sioux, Mahican, and the Five Civilised Tribes have a wealth of information available, so coverage in these areas may be considered exhaustive, even definitive as far as is possible here. While the site is easily able to accommodate full histories of any particular tribal group, the time to write them is harder to come by. Other tribes have so little written about them that short of visiting every Indian reservation, giving detailed histories becomes an almost impossible task. Many of these lesser entries will be no more than a small paragraph covering the tribe's name location, and the names of any known notables. 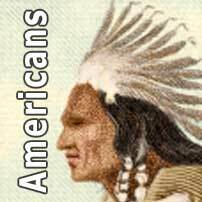 North American Indian languages were first comprehensive classified into families in 1891, by the American John Wesley Powell. He based his study on impressionistic resemblances in vocabulary and managed to identify fifty-eight language families (called 'stocks'). The principle of nomenclature adopted by him has been widely used ever since. In basic terms, there are nine main linguistic stocks with another forty-six language families (some of which are extinct) to amend Powell's original fifty eight stocks. 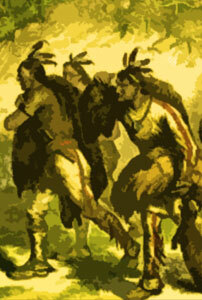 The Athabascan linguistic stock, whilst largely inhabiting the north, Canada, and the woodlands regions, nonetheless included the Apache. Sedentary peoples and hunters often lived near each other and shared mutual hostility and disregard, but, in fact, the categories for sedentary, semi-sedentary, and hunter-gatherers were never clear-cut and many aspects of life were shared by them all. 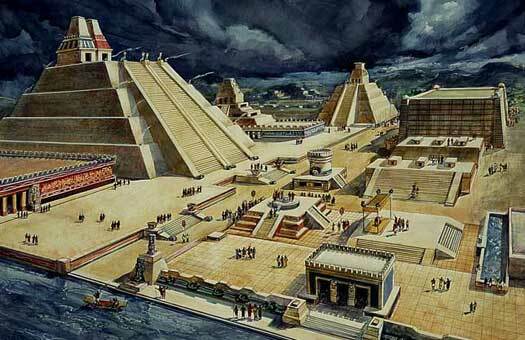 To some extent the large imperial states with highly developed religious and political systems and monumental architecture (which we call civilisations such as Teotihuacan in Mexico or Chimor in Peru) were variants of a widely diffused pattern, the chiefdom. 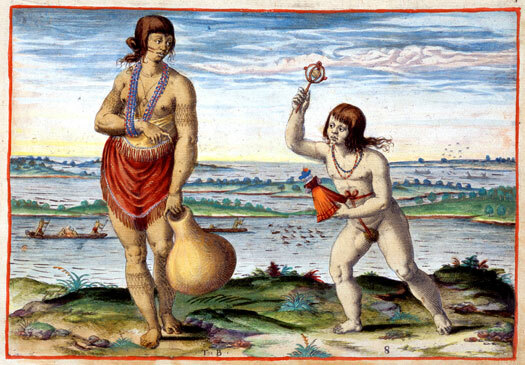 From the Amazon to the Mississippi valley, populations - sometimes numbering in the tens of thousands - were governed by hereditary chieftains who ruled over a large territory from central towns, including smaller towns or villages that paid tribute to the ruler. The predominant town often had a ceremonial function, with large temples and a priestly class. Beautiful pottery and other goods indicate specialisation. The existence of social hierarchy with a class of nobles and commoners was also a characteristic of many of the chiefdoms. It is sometimes argued that, in state-building societies, ceremonial centres became true cities, and clan or family relations were replaced by social classes. The scale of the society was greater, but the differences are not always so obvious. Both the Aztecs and the Incas with their complex social hierarchies maintained aspects of earlier clan organisation. In fact, in terms of social organisation, warfare, and ceremonialism, there seems to be little that differentiates the Maya city states from some of the chiefdoms in South America or south-eastern North America. As an example, Cahokia near St Louis, an important town of the Mississippian culture (around AD 1050-1200) with its great earthen mounds covering an area of five square miles, probably supported a population of over 30,000, as large as the great cities of the Maya civilisation. A distinction between sedentary agriculturists and nomadic hunters may be more useful than the distinctions between 'civilised' and 'uncivilised'. Building and carving in stone, and therefore the ability of archaeologists to reconstruct a culture, seem to have become a major feature in determining the difference between a state or chiefdom - and by extension between 'civilisations' - and societies that do not seem to merit the title. At the same time, we should recognise that the settled peoples and the hunters themselves recognised the difference between their ways of life and, when they were in contact, they often shared a mutual jealousy and hostility towards each other. The Incas looked down on the peoples of the Amazonian rain forest and referred to them as Chunchos, or barbarians, but they could never conquer these peoples. They traded with them from time to time, and sometimes used them as mercenaries. The Aztecs referred to the nomads who lived to the north as Chichimecs, which came to mean 'uncivilised', but the Aztecs themselves may have originated as one of these groups, which were constantly pushing in on the wealthier and better-fed settled areas. 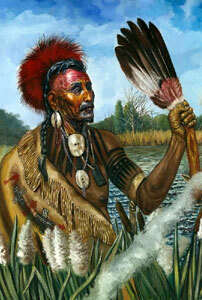 To some extent the pattern of tension between the nomad and the 'civilised' Old World was reproduced in the Americas.